At the Hearing Center at Ear, Nose and Throat Associates we are committed to finding the hearing solution technology that is right for your lifestyle. Once your hearing aids have been fitted, we’ll work alongside you to ensure you get the best experience possible throughout the lifespan of your aids. 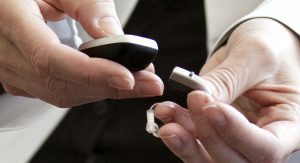 Your hearing aids are valuable pieces of technology with many moving parts. Just imagine some of the components that go into a dime-sized hearing aid: microchip, receiver, amplifier, microphone, digital sound processor, and power source. Now take into account the fact that your ears are constantly producing cerumen (ear-wax) and moisture – and that moisture is the number one cause of hearing aid deterioration. Proper cleaning is essential. That is why our clinicians, office staff, doctors of audiology and hearing care specialists take the time to explain how to maintain your hearing aids and invite all our patients back regularly for a “clean and check” appointment. Your hearing aids are valuable pieces of technology. We believe in teaching each and every patient the best way to take care of their device. Should you ever need a battery replaced, get a filter changed, or a hearing aid adjusted, know that our staff is equipped to handle your concerns.